Summer Roses Nail Art Tutorial | Memorable Days : Beauty Blog - Korean Beauty, European, American Product Reviews. I haven't done a nail art tutorial for a while ^^. Have you missed it? 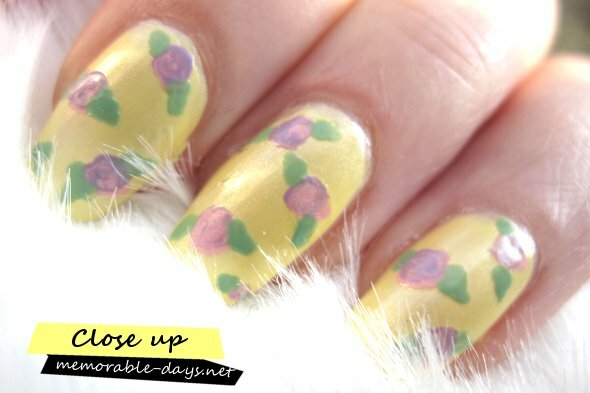 This floral nail art is requested by a friend of mine. It's a very easy nail art tutorial like always ^^. 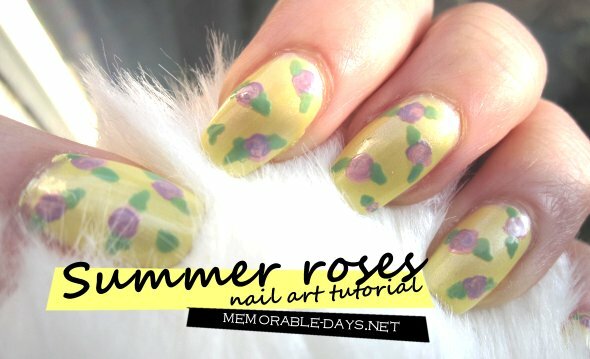 I call it the summer roses nail art tutorial :). The colors makes me think of summer ♥. Since I don't have nail art brushes, I used a yellow dotting pen in this tutorial. If you don't have this dotting pen, you can try to use toothpicks. To create this nail art you will need a yellow, green, purple and pink nail polish. Step 1: Bring one dot of pink polish and 1 dot of purple polish next to each other. Step 2: Swirl around with a dotting pen or toothpick, don’t over-blend! Add a tiny purple dot if you want the roses to be more purple or add a tiny pink dot if you want the roses to be more pink. 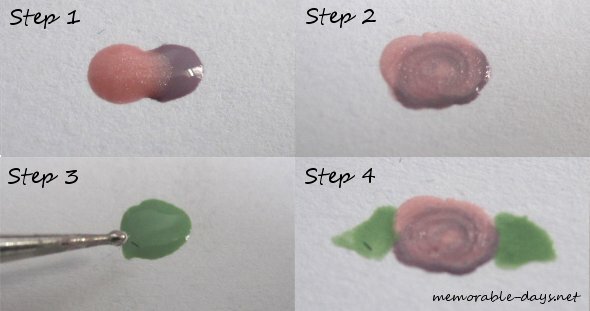 Step 3: Dot some green nail polish on a piece of paper. Step 4: Use your dotting pen or toothpick to dip it on the dot (see step 3) and draw the leaves. Every rose will look different ;), there is no need to be precise with this. You can put large dots to make large roses at step 1. Which nail polishes did I use? - Base coat and top coat from HEMA, Dutch store. - Catrice #240 Sold out forever. Thank you everybody for the sweet comments :D !! Die ga ik zeker proberen! Leuk gemaakt! If only I can grow my nails out long I would totally give this a try! Elisa this look easier now that I know how to do it. From first glance it look reallllllly hard! Oh my gosh I am going to have so much fun browsing through your nail tutorials link!! Thanks so much for posting up this tutorial! @Emy, why can't you grow it that long? So pretty! Thanks for the tute. I'm going to try this out. wow this is an awesome tutorial! looks amazing ♥! @Peach crush, thank you for following me ^__^! awh this is so cute and i lvoe the yellow perfect for easter! thanks for sharing this! I have been wondering how to make them!